Airtame has a blue light which pulses like a heartbeat. It is used to symbolize the device being on and also how much of the CPU power is being used. The pulse has 3 increments, slow (0-50%), fast (50-80%) and faster (80-100%). Generally, if the light is pulsing very fast, the device is in a bad state or is having trouble loading a webpage. Reboot your Airtame and wait for it to show the splash screen. Press and hold the button of the Airtame for at least 10 seconds, at which point the LED light will start flashing quickly, then release. Wait to see the message: "resetting to factory settings"
Airtame will reboot after a couple of seconds and start up again showing the get started. Go to the full guide here. If you need to connect to Airtame's own AP to adjust settings, you can re-enable both antennas by holding the button for 3 seconds. Airtame will disconnect its access points from any connections and will start broadcasting its own WiFi network, named the same as the device's name. A WiFi password will be shown on the TV unless it has previously been removed. 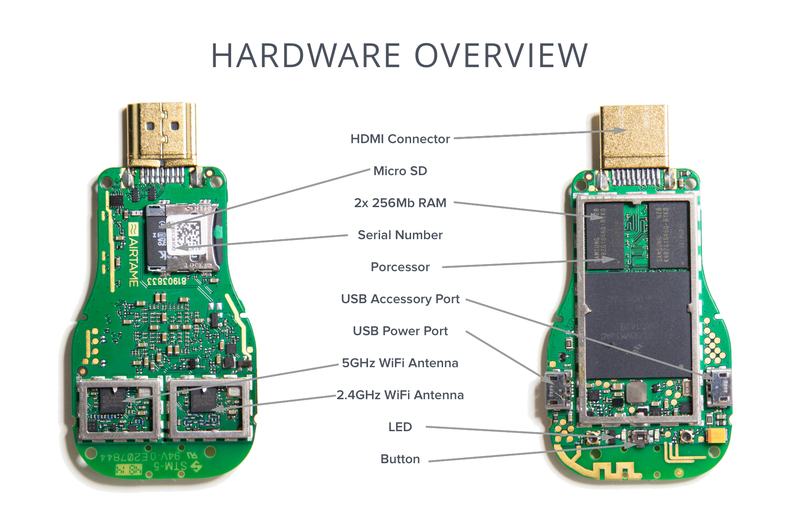 The firmware and all settings of the device are stored on a micro-SD card inside of Airtame. You can access the memory card by removing the back plastic lid of Airtame. This may be required if a manual update is necessary. Tests have shown that Airtame can handle surface temperatures of 73℃ (163.4℉) and internal temperatures up to 114℃ (237.2℉) without impacting performance. 👉 Bottom line - an Airtame can undergo extreme conditions, so normal use of the device shouldn’t cause overheating.